This micro report provides short outline around use of mobile IT devices on Crossrail construction sites and its evolution over time with references to Health & Safety, hardware, software and lessons learned. It provides useful learning to all those involved in IT in the construction industry. Having access to accurate and up-to-date information in the field is a prerequisite for delivering a high quality construction project. In the past field engineers would go to construction sites with paper drawings, many of which could often be obsolete by time they reached the construction site. 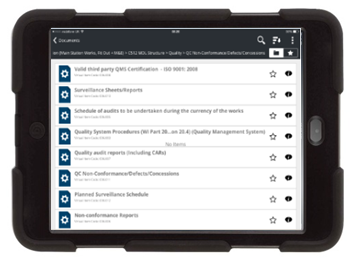 However, mobile IT devices now offer a potential solution to the problems of construction site information decay. A number of mobile IT technology solutions were trialled and implemented on the Crossrail project. This follows a number of reports by construction industry related organisations like Fiatech and Construction Opportunities for Mobile IT (COMIT) with their 2007 and 2012 reports. When Crossrail started construction on site, as standard practice, field engineers were issued with a mobile phone and digital camera. However, a few years into the project, smartphones were established as a mainstream product and replaced simple mobile phones and digital cameras. Around this point in time it was also recognised that tablet devices had the potential to improve certain work processes on site that depend on up-to-date information being available at the point where the work was being executed. 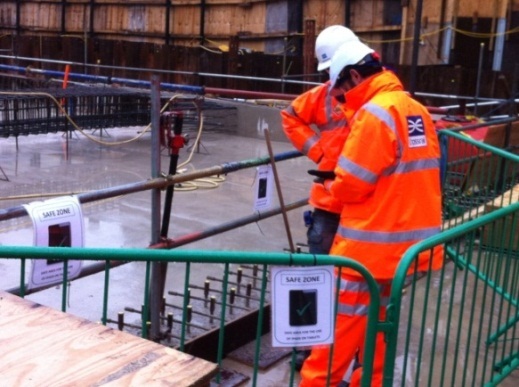 Due to the fast development of technology, an expert working group was put together with aim to research, develop, trial, adopt, and promote appropriate mobility tools, applications and communication technologies for all sites on the Crossrail project in order to equip site based personnel with adequate information to make informed, accurate and timely decisions. A number of trials of the available hardware and software were performed. The output of which are discussed below grouped under the three key identified areas of Health and Safety, Hardware and Software. Recommendations from the trials then follow. 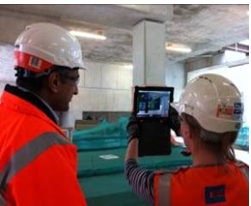 A number of mobile IT device formats were considered and trialled on Crossrail’s construction sites. In the end, 8 inch tablets were selected for on-site use, as they were most favoured by field engineers, with their office based colleagues opting for tablets with 10 inch screens. A decision was also made to use standard consumer products instead of specialist ruggedized tablets, based on consumer grade tablets being cheaper and easier to procure. To increase their survivability in the field, tablets were issued to field engineers with an inexpensive rugged protection case. Later in the project a few 12 inch tablets were bought specifically to run 4D models which were updated on site by field engineers. This was done as the software solution used to update the 4D model was very resource hungry and didn’t perform as well on smaller form factor tablets. However, an App selected for read only navigation of 3D models was better optimised as it worked on all tablets, including the 8 inch models. Early on, the decision was made that mobile software solutions used on the project should integrate with Crossrail’s Electronic Document Management System (EDMS). In line with this, development work started on a mobile app that first enabled read-only access to documents and drawings within Crossrail’s EDMS. This was followed by an upgrade which enabled read-only access to various other types of records stored within Crossrail’s EDMS (requests for information, field change documents, non-conformance reports, snagging, materials compliance records and quality observation reports). Finally, the app was upgraded to enable initiation of certain types of records from the mobile device and their submission into Crossrail’s EDMS. 3D models were periodically migrated to mobile devices in a friendly file format which was stored on the EDMS and then accessed from mobile devices. 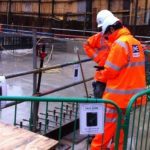 One solution enabled the application of QR codes on drawings that were developed in Crossrail’s Electronic CAD Management System (ECMS) and then published in EDMS via the ECMS/EDMS interface. Users on site were then able to check the current status of these drawings with any QR code reader app. An App used by a number of contractors for the production of redline drawings and monitoring of site issues also had an interface with Crossrail EDMS. Other types of Apps were also utilised but did not have an interface with the Crossrail EDMS. These include the in-house developed vehicle inspections app used for the Vehicle movement planning System . Write a method statement for use of mobile devices on site – treat mobile devices like any other tool. Provide training. Make it part of site orientation. Wireless network – ensuring the availability of a reliable wireless network is a fundamental first step as it is a prerequisite for easy implementation of any new IT technology. Plan for it early and deploy it as soon as possible. Device size – if a device is too big to fit into a pocket of safety jacket or trousers it will probably not be taken out to site and will spend most time inside a drawer. If it is too small, users might take it with them, but ultimately will not use it as viewing models, drawings and other documents on small screen is not user friendly. In our trials, 8 inch devices proved to be a workable compromise as were able to fit into a pocket while the screen was still big enough to be usable. Buying specialised ruggedized mobile devices might make sense for projects in remote locations where lead times are long, but for projects in urban areas and easy access to suppliers it makes more sense to buy standard consumer of the shelf products along with a rugged protective case. Not all users want to change way they work. Some still prefer pen and paper methods. Use of mobile devices on site should be encouraged, but not mandatory. Augmented reality – this technology has great promise for use on construction sites, however when trialled on Crossrail, neither the hardware nor software were at a stage where they were consistently and reliably working. 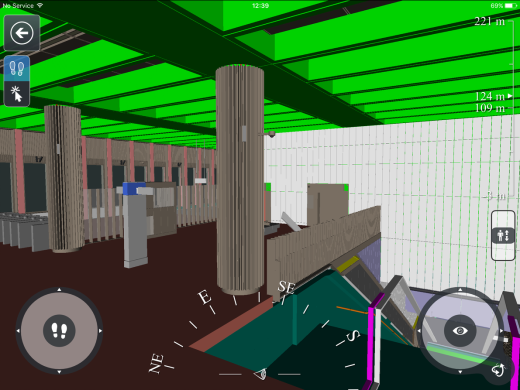 Indoor GPS – while early works are mostly done out in the open, later stages of works are often performed in closed spaces. iBeacons (Bluetooth Low Energy) were trialled on Crossrail but again neither hardware nor software were at a stage where they were consistently and reliably working. Igor is the Construction Automation Manager responsible for a number of information management processes and related systems which support field engineering. Over the past 15 years Igor has worked on a number of construction projects in Croatia, Romania and UK holding various information management related roles. He holds a Bachelor of Science degree in Information Systems.